Comments: The breeding program of Peter Girard began in the late 1940's. One goal was to develop attractive, hardy azaleas. 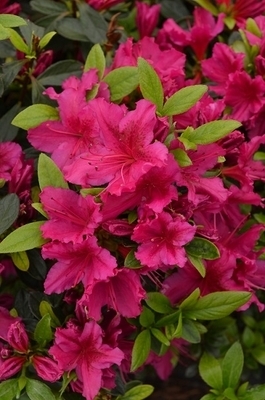 That goal was achieved with many of his hybrids hardy in zone 6, a full zone below many other azaleas. 'Girard's Fuchsia' opens in April with large, wavy, vivid red-purple flowers reaching three inches. In time becomes a rather large azalea so give it room to grow.